Apparently They’ve Solved That Pesky Helium Shortage! And – good news! – just in time for Valentine’s Day! 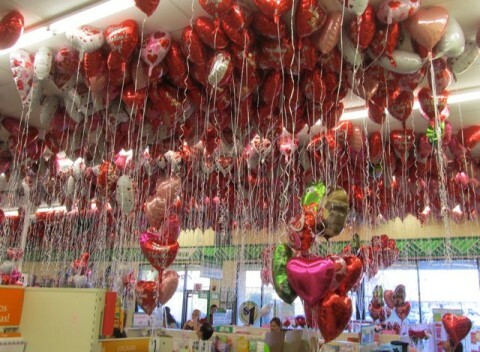 Yet these shots don’t come close to doing justice to the breathtaking sight of this school of hundreds and hundreds of majestic heart-shaped mylar balloons floating up at the ceiling of the local Dollar Tree, with their deadly ribbon tentacles trailing below. Deadly, I guess, if you got one wrapped around your neck and then the balloon gets tangled in a ceiling fan or sucked into the engine of a low-flying plane or something. So let’s be careful out there today, huh? Posted by Ted on February 14, 2014, 2:29 AM.